At a recent bike polo tournament, a vegan friend asked Martin if he was going to be going to the upcoming World Hardcourt Bike Polo Championship in Timaru. Martin replied that he wasn't because he didn't want to incur the carbon impact of flying. * His friend said he should go vegan, then he could fly with a clear conscience as the climate impact of a vegan diet is so much less than that of an omnivorous one. *We did look into him going there via. train, ferry and bus, but it would take 2-3 days each way and we decided that wasn't a good use of his leave! I thought that couldn't be right. However, after crunching numbers, I found it to be much closer than we'd expected. 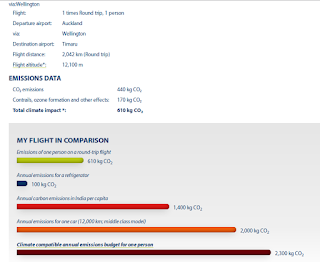 Firstly, I calculated the kg CO2e from flying to Timaru using the atmosfair calculator. This is the most sophisticated calculator I know: it allows you to choose which model of plane you are using for each leg of your journey, which can make a big difference to the amount of CO2e emitted per person. The Air New Zealand website informed me that, to fly to Timaru from Auckland, you take an Airbus A320 to Wellington then a Beech 1900D on to Timaru. Unfortunately, the Beech 1900D isn't listed in the calculator, so I chose a BAE Jetstream 41 as the nearest equivalent. Inputting those planes into the calculator gave a round trip CO2e of 610kg. How does this compare to the emissions Martin would save by going vegan? The last time we audited the carbon emissions of our lifestyle (in 2012), we found that our diet is responsible for around 1020kg CO2e each. I've now divided that into the portions from vegan foods and non-vegan foods (here): I found that almost exactly half of those emissions are from to non-vegan foods. Obviously, if we went vegan, the emissions from the vegan portion of our diet would go up: all the calories and nutrients we currently get from meat, milk and eggs would have to come from somewhere else. However, seeing as most of our lunches and dinners are vegan (if you don't count the ubiquitous fish sauce! ), a good first approximation might be that going vegan might reduce the carbon emissions of our diet from around 1000kg CO2e to maybe something like 600kg CO2e. That 400kg CO2e reduction wouldn't be enough to offset a flight to Timaru, but it was certainly more than I was expecting. Still, if we were willing to go vegan in order to prevent those carbon emissions (something I don't want to do, but think may be at least worth considering in the light of these findings), I don't think it would be ethical to replace them with emissions elsewhere! After all, currently Martin and I are each responsible for around 4.4T CO2e per year - nearly four times what the planet could absorb, were everyone to live like us. We need to be looking for ways to reduce this number, not redistribute its sources. You're amazing Heather, the effort you go to find out about stuff is so admirable! I found this a very interesting read! Atmosfair is really fascinating. I had no idea that different types of planes would be so wildly different in emissions (per person). I'm not sure what I expected, to be honest (bigger planes = more efficient?? ), but that doesn't seem to be borne out in the numbers. Guess I'll be trying to fly on ATR72 flights now, when I can - they seem to be the best option within NZ domestic flights. I was surprised, too! The planes to Timaru seem to be less efficient than what Atmosfair considers 'average' (in Europe) for that length of flight, too. If you don't specify what type of plane, they estimate 500kg, not 680kg - which is a huge difference! 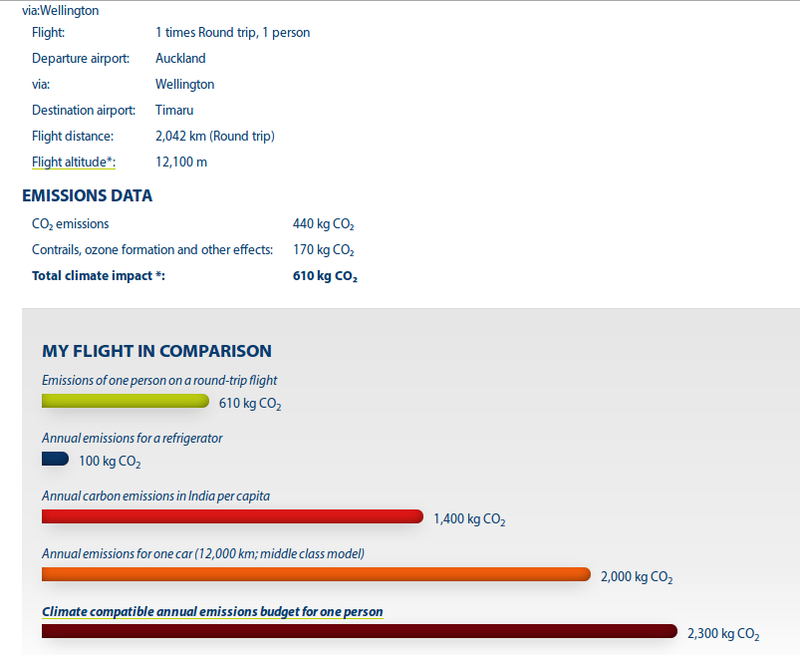 And, surprisingly, the two planes that are used to fly to Timaru both have almost exactly the same emissions, even though one is a 170-seater jet plane and the other a 39-seater turboprop*. * actually a 19-seater turboprop, but there aren't any of them in Atmosfair.